The Gilbert Mediation Center, Ltd. is guided by the knowledge and vision of an experienced trial lawyer and former Associate Justice of the Minnesota Supreme Court. Our mission is to provide an expeditious, fair settlement or arbitration award while emphasizing service that meets each client’s needs. Mediation: We focus on mediation as a key tool for resolution. The Gilbert Mediation Center, Ltd. has assembled a team of widely recognized mediators with many years of prior judicial and trial law experience. This unique approach smoothes and speeds the process of resolution. The Gilbert Mediation Center, Ltd. has three full-service locations with 14 conference rooms and a team of retired judges and qualified mediators who will assist you in mediating your cases. 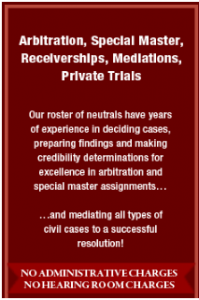 Arbitration and Special Master: Our neutrals have years of proven experience in decision making, fact-finding and credibility determination to assist you with your arbitration, special master needs, and discovery disputes. Looking for Santa Ana CA estate planning lawyers? We can help. Contact us today and we can put you in touch with the right attorneys there.